« Apple Crusher and Press – recommendations please? 4 April 2011: With the weather being so mild and sunny over the weekend, things have moved on considerably, especially the plums and pears. The maximum temperature at Brogdale on Saturday reached 20.4C and an overnight low temperature of 10.6C, making it the hottest day of the year so far (at Brogdale). Most of the plums are now at full flower or not far off. Some of the earlier pears are at 10% open. If the weather continues to be mild then I would think most of the pears will be at full flower during the next week. The cherries, although much advanced from last week are still coming up to white bud. Apples again have advanced but not quite flowering yet – Red Astrachan may reach 10% open by the end of this week. Many of the ornamental Prunus are sadly now going past their best but some of the ornamental Malus are beginning to open now. I was so interested in reading this article! I am a first year PhD Student at the University of Durham, trying to understand the orchard ecosystem, and how the timing of flowering of fruit trees changes across the UK, and with climate change how this might affect the ecosystem – in particular with regards to pollinator abundances. I’m asking for public participation in a UK wide survey of people’s fruit trees (www.orchardwatch.org), however the very detailed data you have could really help as a ‘benchmark’ for this research project. Thank you so much for collecting this data, and making it publically available. I’d be very interested in any historic records you might have, and if you had any other comments to make on my research I’d love to hear from you. With the warm weather over the last week blossom development has moved on quite rapidly, with apples generally at pink bud/10% open and pears and cherries mostly at full flower. The highest temperature at Brogdale this year so far, was reached on 11th April – 22.2°C compared to 10.4°C on the same date last year. Most plums are either at or coming up to petal fall. Plum blossom has generally been quite heavy this year and there is therefore potential for a heavy crop. Many commercial plum growers will be looking at thinning in order to achieve a sensible fruit size. Temperatures have decreased somewhat today and are forecast to continue to be average for the time of year over the next few days which will no doubt slow down the progress of the apple blossom although it looks as though many will still be in full bloom by the weekend. 19th April 2011. Again with the exceptionally warm weather over the past week the blossom stages have all moved on quite quickly and have continued to be about 2 weeks earlier than in 2010. The majority of apples in the collection are now at full flower with the exception of the very late varieties and the cider apples. Most plums and pears have now gone over. Cherries are holding at full bloom but will be starting to reach 90% petal fall by early next week. Quince are at pink bud stage. 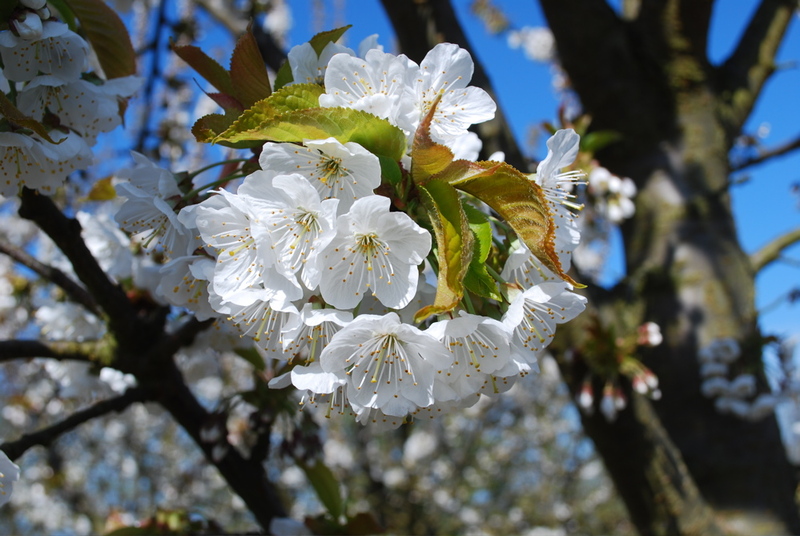 Given the good warm sunny weather over the blossom period, a good set should be achieved although the lack of rain over the past few weeks may have some effect in reducing fruit set – time will tell! 28 April 2011. As you will see everything is now just about ‘over’. The quince will be at 90% petal fall sometime this weekend which will just leave a few very late apple varieties still to flower.